Here is my take on yesterday's action at the British Club Championships. After a sleepless night fuelled by curry, I made it to the course at 7.20am to find two other figures already practicing their lines. I was delighted to see it was Andy and Paul, my less experienced teammates. News was breaking during the next hour as to who we had drawn and I was relatively satisfied with it. We were to face Kent Hellcats, who unfortunately were down to three, Kent Spitfires, who were four of last season's top five, and Midlands Beowulf, the combined forces of Smith and Johnson. Match 1 - Sussex Wasps beat Kent Hellcats 6 and 4. Our opponents were Brian Smith, Ed Haynes and captain, Marion Homer, three of the friendliest people on tour. We quickly raced to a six hole lead with six to play, with the group phases reduced to just fourteen holes. Credit where it is due, the Hellcats fought back to win a hole but it only delayed the inevitable. I didn't enjoy the match because the result wasn't a reflection of the effort the Kent team put in with lighter numbers. We did a professional job and took advantage of a forty minute break due to the early finish. Match 2 - Sussex Wasps halved with Kent Spitfires. Our opponents were Adam Kelly, captain Sean Homer, Tony Kelly and Will Donnelly, four of the UK's top five and was always going to be a challenge. The Spitfires quickly took a lead that they held for almost the entire round. Wasps took confidence with nicking the odd hole here and there and our fighting spirit brought us back from two down to level with three to play. Both teams had chances to win but it will be remembered as a battle of the anchors as Adam and Paul hit crucial aces to keep it all square. In the end, we maybe were happier with the point than the favourites. Match 3 - Sussex Wasps beat Midlands Beowulf 3 and 1. Our opponents were Brenda Smith, skip Chris Smith, Owen Johnson and his father, Paul Johnson. The group hinged on this result and with a Kent match up in the other fixture, we knew we had to win to give ourselves a chance of topping the qualifying. Wasps raced into a four hole lead, which overshadowed the outstanding performance by Chris Smith. Our concentration slipped slightly due to what was going on elsewhere and with three to play, Midlands had pulled it back to two down with the most outrageous ace at the fourth by Owen Johnson. Wasps wrapped it up with an ace at the sixth hole, the penultimate for us, by Andy Wilde. 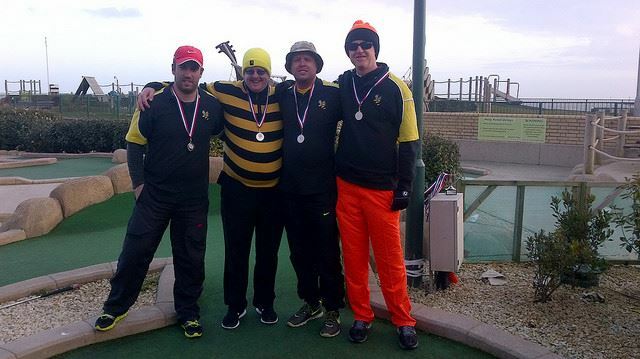 After a slightly nervous wait over doughnuts, the Wasps had won the group by one shot. Semi final - Sussex Wasps beat Cambridgeshire and Essex at the seventh extra hole. Our opponents were Adrian Amey, Chris Wood, Emily Gottfried and captain Mark Wood. The CEMGC were like the Wasps and making their debut in the tournament and it guaranteed that one of the big favourites would be going out. Wasps made a flying start and led by two after just three holes. Steve suffered a loss a form for a few holes which coincided with a CEMGC comeback to go two up with six to play. The spark happened at the thirteenth when amazingly, our opponents could not make three aces. It seemed to inspire the Wasps, who stormed back to lead by one with two to play. Nerves seemed to get the better of Sussex as they could only halve the seventeenth, so onto the difficult last, the Wasps scored three twos. Mark Wood calmly rolled in an ace and when Emily made a two, we went to sudden death. 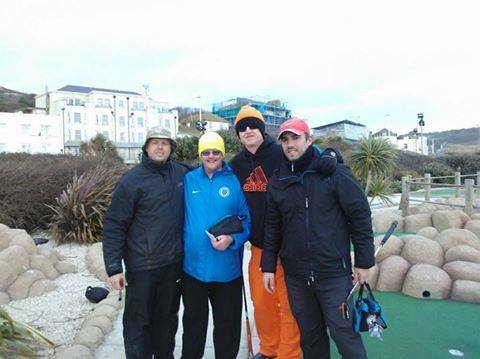 No one wanted to make a hole in one, apart from Nuno and Mark making one at the second. What followed were a number of putts which brushed the hole, all the players having a shot of winning the tie. The CEMGC scored three pars at the seventh, which appeared as if it was going to take us to the eighth. Steve hit a remarkable ace and with Nuno and Andy making twos, we had made the final. Commiserations to the CEMGC, they were fantastic opponents and would also have made great finalists too. Final - Sussex Wasps lost to Midlands Wulfhere 5 and 3. Our opponents were John Moore, the UK's number one Michael Smith, Richard Gotffried and Seth Thomas. We went into the final as the underdogs but we knew if we played at our best, we had a great chance. We thought our luck was in when Andy's mishit opening shot rebounded in. Wasps actually led by one after the second, however Wulfhere turned the thumbscrews and held a three hole lead at the halfway mark, with Seth Thomas making four aces in row. Down by five with five to play, Paul kept the match alive with a last gasp one. Unfortunately for us, Michael, Seth and Richard all aced the pipe shot on the fifteenth which meant it was impossible to win. Handshakes all round and we congratulate the worthy winners on the day. We just fell short but when we received our medals and got announced as the runners up in the British Club Championships, I looked at the guys and just thought how much we had achieved in a short space of time. We may never get to another final but we are always going to treasure the day that we did. This isn't just an achievement by the four of us, it is credit to all the other members of Sussex Wasps who make captaining all of you completely and utterly worthwhile. Steve Ragless turned up to lend his support too. So for the non playing members, this result is for you guys too. Thank you to the course at Hastings for allowing us to play and all our other opponents and teams. We also extend our thanks to our avuncular chairman, Sean Homer, and Marion Homer for their continued and tireless work in ensuring another successful chapter in the history of the British Mini Golf Association. Hopefully Paul will have the stats to hand shortly but all in good time. We are looking forward to the Midlands Open on March 22nd at Dorridge. Sussex Wasps - Runners Up of the British Club Championships 2015 displaying team morale and medals with pride.